Police are treating a series of acid attacks Thursday night across London as linked, and have arrested a 16-year-old male. At least one victim suffered “life changing injuries” Thursday night in the apparent crime spree, which saw five attacks take place in 84 minutes in East London and Islington. The arrested teenager is being held on suspicion of grievous bodily harm and robbery. Police described the attacks in their statement, which revealed the first attack took place at 22:25 on the Hackney road. Officers said the male victim had been on a moped when a pair of men on a second moped pulled up beside him. The men threw a “corrosive substance” into his face, before stealing his moped and riding away. When officers responded, they found that the man had sustained facial injuries, but they are not being treated as “life threatening or life changing”. The second attack took place 40 minutes later on Shoreditch High Street — a location just half a mile away. 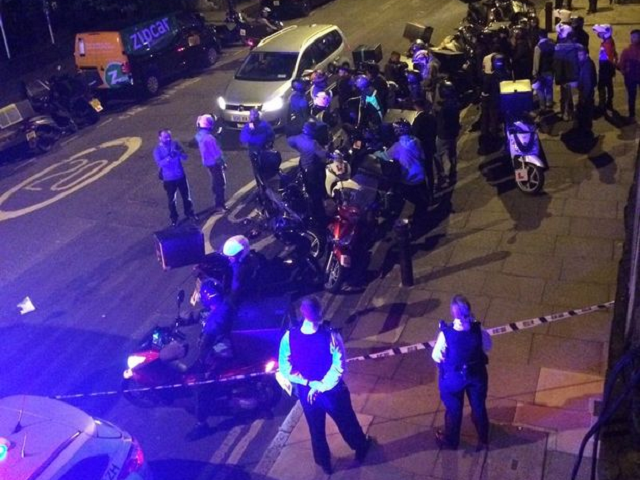 Once again, two men on a moped threw acid into the face of a man, who was taken to a hospital. Eight minutes after that, police received a third call after a man in his 20s had acid thrown in his face. The most serious of the attacks, a crime scene was set up at the location and the man is reported to have received “life-changing” injuries. Another 19 minutes later police received a fourth call when another man on a moped had acid thrown in his face, with the attackers stealing his moped and again riding off. The final incident took place in Islington, North London, and took place another 12 minutes later when a man was reported to have had a corrosive substance thrown in his face by two males on a moped. Police are appealing for eyewitnesses to the attacks. London is seeing a sudden surge in acid attacks, with the 261 attacks in 2015 jumping to 458 in 2016. There have been over 120 attacks in London so far this year, with the frequency of the attacks leading to the city being dubbed the acid attack capital. Acid appears to be finding favour with gangs and individuals to settle disputes and launch attacks, as simple bleach products and drain unblocker is available cheaply in shops without checks and carrying it does not incur penalties, like knives do. Home Office minister Sarah Newton told the BBC Friday that while the government was considering tighter restrictions on such materials, the fact they could be found in any kitchen cupboard made legislation difficult.